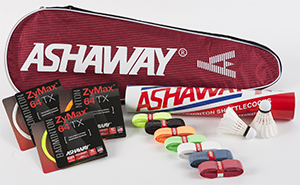 Ashaway Racket Strings has introduced ZyMax® 64 TX, a new badminton string with a proprietary textured surface coating to enhance feel and control of the shuttle. Like its ZyMax 68 TX sibling, ZyMax 64 TX utilizes Ashaway's proprietary BETA polymer fibers and is constructed using the company's special ZyWeaVe™ core technology. ZyMax 64 TX is 0.64 mm in diameter for optimum power and performance. The BETA polymer ZyWeaVe core provides minimal tension loss and the textured coating adds stiffness to the string bed, enhancing both control and grip of the shuttle. "Our ZyMax TX family of badminton strings offers a triple-play of proprietary features," said Ashaway Vice President Steve Crandall. "A BETA polymer ZyWeaVe core is encapsulated with a high tenacity BETA polymer wear surface, and then bonded with a proprietary textured coating. Thinner ZyMax 64 TX provides enhanced response and control, while the heavier ZyMax 68 TX is geared for durability." ZyMax 64 TX is geared for professional players and advanced amateurs desiring the superior performance of a micro gauge string along with better feel and control. The string's BETA polymer multifilament core provides 25% better stiffness and elasticity than comparable strings, and its BETA polymer braided construction provides 25% better knot and shear strength. In addition, Ashaway's trademarked ZyWeaVe technology generates a string core that is stronger and holds tension better than traditional badminton strings. This allows for thinner, more playable strings that perform consistently at higher tensions throughout the life of the string. White, orange or optic yellow in color, ZyMax 64 TX is 0.64mm thick (22 gauge) and is available in 10 meter (33 ft) sets and 200-meter (660 ft) reels. Recommended stringing tension is up to 32 lbs. (14.5 kgs).